This page summarises the main points of EC. Use the tabs above for more details about all aspects and challenges of the practise. Elimination Communication - EC for short - is a way of communicating with your baby about his or her elimination needs. It is also known as baby pottying, holding out, infant potty training, natural infant hygiene etc. You know how you tell when your baby is hungry or tired? The way that they wriggle or cry or act in a certain way to alert you? They also have ways of telling you that they need to do a wee or a poo since it is innate in babies to not want to soil their "nest". When my baby acted that way, I held her over the potty and made a sound that she soon associated with going. In terms of how do you begin with EC - remember when you were nursing a new baby and she would fuss and squirm and pop on and off the breast? It was likely because she needed to do a wee or a poo and she hadn't yet learnt that she was expected to go in her nappy. You know when people say - oh, I know that my 2 or 3 yo toddler needs to do a poo so I won't change that nappy until she does... or when they say - oh, he's doing a poo, look at that stance or face or whatever... 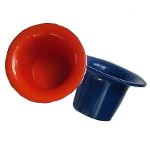 When doing natural infant hygiene or IPT or EC, you would give the baby the opportunity to do their business on a potty or bowl or toilet along with giving a cue sound (many people use "sssss"). Babies soon learn to release upon being held in a toileting position and being given the cue sound. Don't over think it - just get started! Next time your baby wakes (either in the morning or from a nap) take off the nappy and hold him/her over a potty or the toilet or the laundry tub or even the bath. Hold his/her back against your stomach with your hands under the thighs. Babies generally hold their urine while sleeping and then need to go shortly after waking up so that is a good time to try for your first "catch". For more detailed information click here. One of the beauties of elimination communication is that you don't need much "stuff". At a minimalist level, all you need is a baby and a fair modicum of willingness to learn with your baby! Slings, potties, training pants, split crotch pants and other items are nice to have but not essential. Another view of what sort of gear can be useful: here. When you carry your baby in a sling or wrap, you are very close to each other and it is much easier to pick up on fussing or small wriggles by your baby that indicate that a potty opportunity may be required. This also takes advantage of a tiny baby's innate inclination not to "soil the nest". The best carriers for EC are those that make it easy to pop the baby out and then pop back in again with no fuss or contortions. For these reasons, I used an unpadded ring-sling and a tube sling (or pouch). I couldn't live without my slings! I used a couple of simple small potties that forever seemed to change their position around the house. Do not buy a throne-like potty for using for EC with a baby - the baby might disappear down the hole! More seriously - they are generally too wide, too long and too high for a small baby. I prefer single piece moulded potties so that there is no chance of little legs getting pinched between separate pieces. 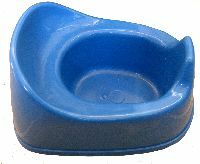 Potty bowls are fantastic for use with a newborn and, for girls up to about 9 months old (although my niece was still using one at 18 months). Little boys tend to outgrow the diameter of the bowl earlier. You can hold the bowl between your knees and support the baby over the bowl. This is also called a "top hat potty" or "lap potty". Training Pants are very useful for active babies - they make pottying quick and easy. There is no need to lay the baby down to remove and replace a nappy. 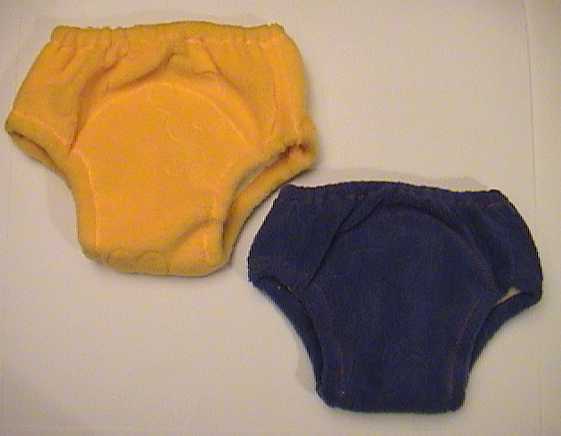 They are absorbent enough to hold an accident, easy to wash and quick to dry. I highly recommend moving from cloth nappies or diapers as early as possible, particularly when at home. Most people who make the change say that they should have done it earlier! If you prefer to stick with nappies for a while longer yet, then terry flat squares and prefolds are very good - easy to put on and off, easy to wash, quick to dry and very economical. You can use a snappi to hold them on, rather than bothering with nappy pins - but even more convenient is using a nappy belt/prefold belt. You put the prefold belt around the baby's waist, fold the terry square or prefold into a pad shape, slip the nappy between the baby's legs and into the belt at front and back waist. When it is potty time, you can just slide the front of the nappy out of the belt and then, when finished, slide it back under the belt again. MCN (modern cloth nappies) are convenient for putting on but often they have a stay dry liner which doesn't help the baby to maintain (or re-develop) awareness of wetting; most MCN are very absorbent - much more than you would need for EC. That said, there are some beuatiful works of art available these days! 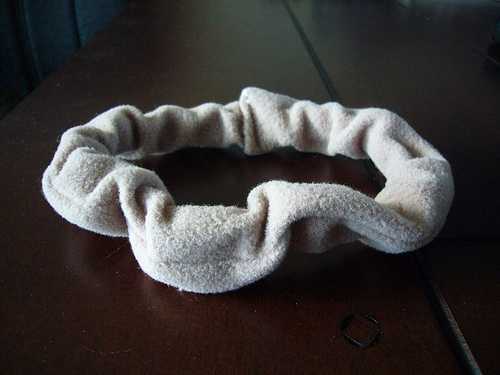 Many people find leg warmers a great way for keeping little legs warm during colder weather. 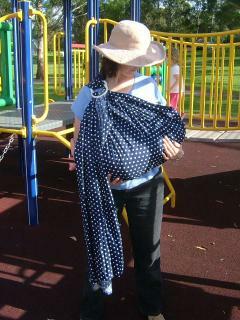 Another great use for them is to cover the gap between socks or shoes and riding up pants legs when baby is in a sling. Many people like the Asian style open crotch pants, particularly for colder times of the year because you can put training pants or a nappy on over the top of the open crotch pants - Superman style! 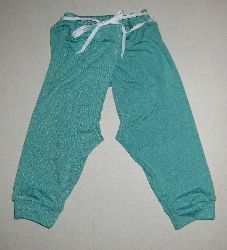 I make various styles of open crotch pants (kai dangku) - or you just might find them in baby shops in an area of high concentration of Chinese or Vietnamese people. You can also make your own split pants by cutting a slit in the crotch of a pair of close fitting tights or other baby pants that you already own. If you have other suggestions for "must have" EC gear, please send me an email!